Published May 7, 2014 By Anna T. This post may contain affiliate links. Regardless, I only recommend sites I've researched and/or used and trust. Update 7/31/17 – It has been brought to my attention by some terminated workers that ZeroChaos no longer has their contact with Google for this project. 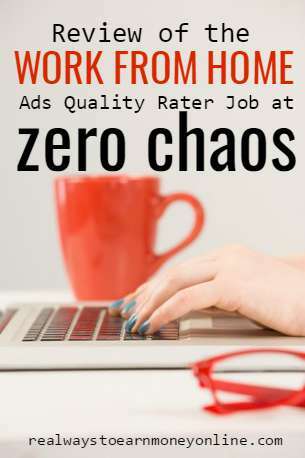 ZeroChaos occasionally advertises for work from home ads quality raters. This particular position used to be through Workforce Logic, so you might already be familiar with it. Anyway, a job like this is a great option for many people who want to work at home because it's completely non-phone, flexible work. If you have tried applying with or working for Lionbridge, Leapforce, Appen Butler Hill, or any other company that hires for similar positions and either didn't like it or couldn't get accepted, you may want to keep an eye on ZeroChaos for when they have openings. Currently ZeroChaos requires that you be authorized to work in the US in order to apply and the work must be performed in the US, so this doesn't appear to be open worldwide. What does an ads quality rater do for ZeroChaos? As an Ads Quality Rater, you will be responsible for reporting and tracking the visual quality and content accuracy of Google advertisements. Ads Quality Raters use an online tool to examine advertising-related data of different kinds and provide feedback and analysis to Google. Projects worked on may involve examining and analyzing text, web pages, images, and other kinds of information. How much do ads quality raters make? ZeroChaos pays their raters $15 an hour. Payments are made weekly via direct deposit. Are you considered an employee or an independent contractor? You work for ZeroChaos as an employee and you may be eligible for some benefits after a few months of working for them. However, it looks like you're a temporary employee. I've been reading that they will only let you work for them for one year. But the good news there is that you can re-apply and get hired again, but you have to wait three months after your contract has ended to put another application in. Who is qualified to do the work? Their job postings state that you must have a college degree. If you do not have a degree, you need to have experience doing this type of work to be considered (I think if you've worked for Lionbridge, Leapforce, etc. that *may* count as experience). You also need college-level fluency in the English language. Even if you don't have a degree or experience, apply anyway. You may still get a response. The only thing you need is a high-speed internet connection. It doesn't appear to matter what sort of computer you use. ZeroChaos requires that you work at least 10 hours a week but not more than 30. You are allowed to log on and work whenever you want to as long as you meet the required number of hours each week. What do people say about working for ZeroChaos? Most people seem to really like it but are kind of bummed about the maximum 12-month work requirement. Even though you can re-apply three months after your contract has ended, that still leaves you with three months of finding other ways to make money. Definitely keep some other work on the backburner if you decide to do this. Apart from that, it looks like the job is pretty simple and that they pay on time. You can read a few reviews from people who work for the company here at Glassdoor. Go here to check for current openings. Good luck! Want more info on search engine evaluator/ads quality rating work at home jobs? The e-book, “Make Money From Home As a Google Quality Rater,” breaks it down nicely for you. It's 40 pages worth of text on what Google raters do, where to find the work, and also where to find other Google raters to communicate with online. The book is very highly-rated at Amazon. The task shortages seems to only be getting worse. Last week I was only able to put in 3 hours of work! And by the way the shortage is not only for English raters. I’m a bilingual rater and I have been experiencing severe shortages for the past 6 months or so in my native language. Very frustrating to say the least..I have been rating for almost 2 years and my contract is up again at the end of the summer. I don’t hold much hope that it will be renewed yet again. This type of work is clearly unstable and the way I look at it is that it helps me pay a few bills. Even though it is a 12 month agreement Zerochaos can cut you off at any moment and will never tell you why. It could be that they hired too many raters and are only willing to keep the most accurate and productive ones or it could just mean that your work is not up to par. I just wish Zerochaos could be more transparent with us. We’re not just numbers. I’m currently working for ZeroChaos. I started last April, 2015. Work was great for the first 6 months. I was able to get up to 29 hours a week, each and every week until around October/November 2015. Things started slowing down. Then shortly after Christmas I believe the “task shortage” bar appeared every time I tried to access tasks. Since then, I’ve only been able to get around 1-2 hours a week. I have to keep checking for tasks, which is a pain, because I keep running to my computer hoping that something’s there. But almost always, nothing. I’ve contacted them a couple of times regarding this, but keep getting the same old computer generated response. My contract ends in April, and I’m hoping that things will pick up really soon. But I’m losing hope. I’ve also applied with iSoftStone, Appen Butler and Lion Bridge. iSoftStone responded a week later with the NDA for me to sign. I was so excited!! I immediately signed it and sent it back. But never heard back from them. I’ve emailed them, called them and was given an email to send to the person in charge of recruiting, but no response as of yet. It’s been a few months, so I guess that’s dead too. Haven’t heard back from Appen Butler or Lion Bridge either. Oh, and ZeroChaos contacted me a week after I first applied, in case anyone wanted to know. I’ve read where a lot of people say it took a while for them to respond. But not for me, fortunately. It took a whole month though to go through the tedious process (paperwork, etc.) to begin work. You have plenty of paperwork to fill out, references that WILL be checked (and you’d better have a few good business and personal references too). I also had to go to a place near my home to show ID, sign a form and get finger printed. But anyway, it was well worth it to me because the job came at a great time. And the flexibility of the job and the pay worked for me. I just wish they would let us know what’s really going on! Oh how I would love to get back to being able to work 29 hours a week. I really miss those days. hey KMillaz, Same thing among all raters as far as I know. FYI, they are no longer hiring English Raters for work at home. Is this why they are not giving English raters any work? Haven’t had work in 4 days. Anyone been having task issues again? I have not had any tasks since yesterday. Hello everyone received an email stating that I’m fired as of today. I’m not sure of any other companies to apply for but any tips of sorts will greatly be appreciated. The same happened to me.. You are not the only one.. I wish luck to you in the search.. Thank you Grecie I wish the same to you and everyone here who has/is going through this. Good luck to all. I am so sorry to hear that news :(. I guess it’s a reminder that we can never really rely on this work for anything more than extra cash here and there. Stay positive! There is so much more out there, just look at my comment a few comments down it will give you a place to start. Truthfully you could be back working in a 2-3 weeks if your dedicated. For now I’m just going to appreciate every week I have with this opportunity. Blessings to you two and anyone else in the same situation. Keep your head up! Tks for the kind words. Hello. I was wondering if you received any indication that your work was an issue. Did you ever receive an email stating that your rating ability was not sufficient? I received once one I believe two months after I started rating and have been rating six months now and haven’t received one since. I’m scared every day that I will lose this opportunity. I did work for Leapforce at one time so that may be an option for you. Do you all rate only in English? I rate mostly in French (almost never in English to be honest) and I do not think I struggled as much as you did to get tasks. During the holidays/weekends I had work available and rarely got the “no tasks available” (but had a hard time loading pages at some point). even when I did get the “no task available”, sometimes just by clicking a few times on “acquire new task” out of frustration I was able to get work within 10 seconds. maybe there aren’t many french raters so I am lucky to get tasks? is it how this work? we have to “fight” to get tasks? Tried today once again and no tasks are available. Anyone had any luck? Since we have limited amount of tasks, perhaps we should look for other online opportunities! James, did you have any tasks today? Here’s hoping we don’t need to wait too much longer for a fix…I’m still no getting any tasks as of 5 or so minutes ago. You mentioned there were a bunch of other online opportunities that you knew of. Would you be able to share any of that information? I understand if you don’t feel comfortable doing so, but if you do, it would be greatly appreciated! Somehow I managed to get 3.25 hours last night it felt amazing! Haven’t tried yet today so hopefully my luck continues, and I really hope you all get tasks ASAP! The feeling of no tasks is a bitter one…. Wishfinger, I would be happy to get you started with recommendations that I am familiar with. The first place I would look is, isoftstone. You need to go to their website to get going but I’ve only heard good things and they have many kinds of online opportunities. Other than that, someone who is close to me loves Leapforce! It is definitely longer term and there can be tons of hours available depending on the project you are in. Also see Appen Butler Hill, and LionBridge for multiple opportunities. These will keep you busy, if you apply to them all just give it a little time and I’m positive at least one will be looking for you to start. Most require an initial test but with a little study I’ve heard they aren’t to bad at all and worth the effort. These are just some of the opportunities I’m familiar with, I’m very intrigued by ABE Services as well which I want to check out when the times comes to do so. I hope this helps! Stay positive and hopeful there are so many opportunities for those who are perseverant. Blessings! I have been trying to work all day today and nothing. Glad to see I am not the only one having this problem, but this will be the 3rd week for me submitting the no task form. Hey there everyone! I’ve always wondered if there was a single place where raters actually talk to one another. Little did I know it was in the comments section of an article from 2014. This has been very helpful and comforting to read that I’m not the only one being shafted this past holiday season lol. I planned on making a lot of money this month, and am now barely making rent for January. I suppose this goes to show I can’t always depend on this as a sole source of income. Let that be a lesson to any looking to join! Here’s hoping these damn shortages are solved by tomorrow or at least sometime this week. I need them munz, hunz. We don’t get a whole lot of communication from our mysterious higher ups, so to all of you–keep up the good work! Wondering if I should start a forum where we could all gather and talk like this in a more structured way, or if such a place already exists. Thoughts? I also think some sort of forum would be nice… I think it is good that something was started here as it is comforting to know that other people are having issues. Zerochaos seems extremely private and they provide little assistance or feedback when there are technical issues as such or just in general. There are other rating sites out there that have blogs built within the actual worksite. It’d be nice for us “zerochaosers” to have that opportunity too. I’m starting to lose patience waiting around for them to begin giving us tasks again (this is much needed money that I’m losing out on!) and I’m going to give them this week before I start looking for other opportunities. However, I’d love to hear about other online opportunities that exist so that if needed, I can start searching and applying! I have heard about ABE services and that is my next choice but what other ones are out there similar to zerochaos? Nice to hear from you Daniel and Mar! Same for me here as far as no tasks this weekend…. I am fairly certain I will be short of 10 hours for the second week in a row unless tasks somehow appear tomorrow. Just trying to stay positive here, eventually we have to return to normal, since the holidays are now behind us I believe things will straighten out soon. The “intermittent task” message can’t last forever, hang in there everyone! Happy New Year everyone! Best wishes! Happy new years everyone! I was only able to do 1.80 hours on friday and so far haven’t had any tasks today. Most likely it’ll be like that tomorrow. I actually havent had tasks on Saturday or Sunday for a while. Happy New Year everyone! A quick update: I was able to get 1.75 hours this morning but only 30 minutes last night…. hopefully you all are having better luck. Seems as though I have ran out of tasks now but hopefully more will come up throughout the day! I just want that “expect intermittent task” message to disappear! Can’t wait for it to go away either. Here’s hoping, brother! Work has been pretty tough to acquire this week. Is it necessary to submit the form by Friday or can i do it on Sunday? I’d like to wait until Sunday to see if I can complete the 10 hours before I fill out the form? I got tasks today FINALLY ! Still slow for me as well, it seems as though tasks become harder to acquire as the week progresses. I just really wish there was some type of communication, letting us know what is happening and what to expect. Without it we are all left wondering. Hello everyone I’m also experiencing task shortages. Last week I was only able to complete 14 hours and I always make my 20 hours each week. Today also has also been extremely difficult to complete any tasks. I hope it picks up again. Has anyone had any luck acquiring tasks today? I’ve been trying all morning and haven’t gotten anything. i was only able to get an hour today, so annoying. It is really stressful, I’ve only gotten 30 minutes today. Yesterday was 3.75 hrs and then they ran out. Today I squeezed out 2 hrs. The system was a bit off…tasks took longer to load and I only think it will get worse as the week progresses. I got two tasks today, it has been so slow for the last two weeks. The past two weeks for me I have only been able to get 10 hours eachof those weeks. I’ve been working with zerochaos since August and I’ve never had this problem before. I’ve always averaged 25-29 hours per week. This week, I got 4.5 hours on Monday and 2.75 hours yesterday. I ran out last night around 10:45 and have not been able to get any since. The past two days I have been getting more work at night than in the morning.. However, going off of the trend that has been happening the past two weeks, usually Wednesday is when it is almost impossible to get tasks and then Thursday-Sunday you get absolutely zero tasks. I wish they’d send us an email or something saying what is going on and a time frame on when this will be fixed because their message in the system isn’t comforting at all. Who’s to say this issue continues even past new years? I agree all around but have no expectations that we will get explanation. I’ve generally pulled 20 or so a week. Over time weekends have become harder to get hours generally. I, too, almost always got good hours in he early. a.m. as I would do 1.5-2 before 9. Now it’s just no tasks. Of I get anything it’s at nite and it’s a stuggle. I get the sense that are rationing tasks and after a certain number you go “off”. Also I’ve done this dance of signing in and out and getting small chunks of work each time. I am at 6 for week and if Wed,stays bad, well it will be an under 10 for sure. I can li with it if it’s short term, but that’s the big question? WOW! Tasks are available again! Anyone know where the “unable to meet minimum hours” link is? They reference it in the original startup emails but don’t say where to find it… Any help would be great and maybe it isn’t necessary because it was more or less a system issue? james, here is the link: http://goo.gl/dmDWI. did anyone get any tasks today? Sadly today has been another zero task day… I have a feeling tomorrow will be different with everyone coming back from the long Christmas weekend. Hopefully they can get to work on the system and get us back to tasks ASAP… at least I hope! i don’t have tasks since Thursday. Same with last week. Same here.. I was only able to get 10 hours last week and I got 10 hours this week as well, barely. Really looking forward to getting back to my 29 hours. Considering it is the holiday season not sure a lot of folks are trying to rate but just wanted to see if anyone else is still getting the “expect intermittent task shortage” message. Monday/Tuesday/Wednesday were alright but I had to check often to get anything at all. I tried Christmas and Christmas Eve but couldn’t attain any work other than one 30 min chunk of tasks. I am close to 10 hours but not quite there yet. Even though I have the time to do 20 hours plus I will be happy to hit 10 this week with the lack of tasks. I am hoping others are having better luck this week? I hope we can just be back to normal soon! Is there anything I would need to do if I am under 10 hours due to system issues? I am assuming they will understand that it wasn’t a lack of effort…Blessings all! same here. Ii got close to 10 by Wed. but could get nothing on Thursday or Friday (expected); still not getting anything today, so here’s hoping. I’ve filled out the no tasks form twice; my understanding is that there is a form you fill out (ZeroChaos explains it in an email they sent on billing) if you either won’t be able to work a week at all or if won’t/don’t make 10 hrs. Thanks for sharing your experiences with me and thank you for your guidance in regards to the form. Now that I think about it I do recall reading about that particular form and I suppose if I don’t see any more tasks by tomorrow I should probably fill it out just to be safe. Is that your plan of action? I feel as though no one is adding tasks or working on the shortage issue, because of the fact it is the holidays and a weekend, so we might be out of luck now until Monday…I hope I am wrong but at the same time I am just so thankful to even have this opportunity. Just want to make sure I do things right and I think we will be back in action soon! Thanks again for the information Gail I will keep me posted, I am hoping we can still make it over 10 this week :). Blessings! James, just go to the Rater Hub in the system and under “Contact Ads Eval” you will find the form to fill out to report task shortages. I’m also under 10 hours this week, but I’ve only filled out the shortages form once since they do advise that we should expect task shortages. I don’t want to pester them since they do have the warning and also since it’s the holiday weekend. Hopefully next week there will be more tasks available. If you do not get your full 10 hours, there is a link in your instructions to a form you’ll need to complete. It’s not a big deal, it just lets them know the reason why you didn’t make 10 hours, and you can select “no tasks available” as the reason. If you read through the information they gave you when you began the job, the full information about how to handle task shortages and under-10-hours is all in there. Good luck! For some reason don’t get the “warning” on my eater hub tab, about expected shortages. Same last week, I may be my new set up. What exactly does it say? I agree sending no task forms is a waste of time, now that I know this. I would guess next week will be more of the same and with luck it all be back to normal after New Year’s. Glad to find kindred spirits as it takes away some of he stress. It was by luck. Wish there was more of a regular meeting place on line to share etc. Violet, thank you so very much for your guidance! I was able to find that form and I will select the “tasks not available” option when I submit it :). You are too kind for helping me! In response to Gail, the exact message across the top of the page, just above where it says “no tasks available” is “Expect intermittent task shortages, especially for desktop tasks. If you can’t acquire tasks now, please try again later.” At least we know that there is a system issue… I am sure they won’t be down for much longer with this issue but perhaps with New Years coming up we will need to be extra patient as you said. I guess this is the universe’s way of saying I should finally do some cleaning hahaha! I was also thinking the same thing Gail, there has to be a better place for us “raters” to chat! Perhaps a forum of some sort even if it is very simple it would be extremely helpful. For now we just all need to imagine the glorious 29 hour weeks of the past where tasks were abundant….because they will be back before we know it! Anyone struggling with work once again? Haven’t been able to get any in 3 days. I haven’t had any issues getting work this week actually I have had continuous tasks, However the last few weeks prior I was short 3-4 hours not able to get the 29. Last week was the firs time in the prior 2-3 weeks where I was able to get my 29 hrs. I do email them the shortage task form and it seems within a short amount of time I have tasks again. Best of luck. Tasks are available again for me! I was able to get them again about 45 minutes ago, first time in nearly 3 days. Hopefully everyone else will be able to get back to work soon! Jo I am so glad to hear that :). I will be able to try it out on my end tonight so hoping for good news also! Thanks for sharing this information it made my day to hear they are back. Here is to many many more tasks, blessings! I haven’t had tasks in almost two days. I am only now reaching my ten hours where I usually get ten hours in two days. I can get 30 minutes here and there throughout the day but one day this week I was only able to get 15 minutes. They have a message in the system now saying to expect task shortages… I wonder how long this will last. Where is the message? I made my 10 by Friday and nothing so far this weekend. But don’t see a message. I have sent work shortage forms but those never get a response. This message appears at the top of the screen when you log into the system: Expect intermittent task shortages, especially for desktop tasks. If you can’t acquire tasks now, please try again later. Same for me… up until this point, I have been averaging 27-29 hours per week. So it is a little disappointing around the holidays. I hope this is just a real shortage and not a sign of the end coming (“you’re contract has ended”). I’m just concerned because I know other people who at this moment continue to get work… I am also going to apply to ABE services if and when this job ends, although I really enjoy working with zerochaos. This position is now being offered through a company called ABE Services, but I can’t find much info about them. I heard that ZeroChaos was not longer running this for google, but I’m not sure how true that is because there are still contract workers for ZC who are still being assigned tasks. Have not heard of that… maybe it’s just another company that is hiring for the position. If you search ads quality rater jobs, zerochaos is still hiring (although in other languages at this time). Or at least they still have job ads posted.. Yes I am having the same exact issues and its really frustrating because I also havent received any e-mails on how well im doing or if im doing everything wrong!! I just hope it picks up soon and I am not let go of after only two weeks. I believe the problem is fixed, as I have not had any issues at all today and have been able to steadily acquire work. This issue had taken place since last Thursday and I was not able to get all of my hours in before Sunday. I wish we could get compensated when we cannot acquire work because of their technical issues… Oh well. Hopefully it stays fixed..
Are you still having technical issues with the rating system? No but struggling to get tasks since yesterday evening.. I’ve submitted two forms saying that I have no tasks available. However, I have a friend who isn’t having any problems acquiring tasks. What about you? When I get the “no task available”, sometimes login out and back in works to get new tasks or even just clicking many times on “acquire next task” I often get new tasks even if 5 seconds ago it said none were available. hope this helps! Don’t even mess with these people. They are a joke. I did this last year and to apply, you go through this ridiculous process that feels like your applying for a position with the FBI or CIA. We’re talking everything from them having to call every single person you’ve ever worked for (and they ask them ridiculous non-related questions that sounds like it’s a high school popularity game – got this info from one of my former employers they called). Then, after about 3 months of jumping through hoops and doing all this time consuming FBI/CIA like application stuff, you finally begin work. They tell you that you are guaranteed work for a full year for your “project” (I use that word sarcastic). So, anyway, long story short, I did everything correctly and then after 1 month, they terminate me (or “end project”) with no reason, no explanation, no nothing. 2 days prior to this, the system was showing “no work available”, and then the day of termination, I got a chain/generic email reminding me of rules, etc. I replied to this asking if I am doing something wrong to please let me know so I can correct whatever the issue may be moving forward, bout an hour later I was terminated with yet another generic email. The other thing is you can never speak with anyone on the phone…it’s like they all hide behind computers – no contact numbers givin to speak with a so called manager or anything. When I emailed them asking why my “project” was ended after only 1 month when I was guaranteed a year, it took them 2 days to even respond and their excuse is “we don’t have that information” (which is their answer to almost every question you ask them). Zero Chaos? More like Mega Chaos! AVOID wasting your precious time with these circus clowns at all costs! I am amazed at the changes that recent applicants have offered. The first thing I have to say as to an older comment, that it’s relative. That’s an odd response. Here’s the brunt of my experience. I received an email last year around this time and did not get a formal invitation til earlier this year. Started in Jan and got laid off last month. Like for several, there was little notice and little feedback. It’s difficult to maintain a standard without feedback. It takes 180 days, not 90 to reapply. If they have changed the guidelines in that short amount of time, that should be a red flag, people. And to reiterate, just because there have been exceptions about support issues does not make the rule. There is little support and I’m not a negative person. Quite the contrary. I’ve been a stockbroker and a sales professional. I simply call a spade a spade. When I asked about a time sheet, the response took almost a week and to add insult to injury, the supervisor did not even read what I wrote. He made a comment about tasks availability. Luckily, I rarely had trouble with tasks availability but I had to increase my scheduled availability. Caveat Emptor. You have been forewarned. I applied with ZeroChaos last week after sending my résumé, I was accepted the same day. After following the instructions of setting up a new gmail account I was then sent this “ridiculous” test that seem to be impossible to pass. I am not sure how they decide who will or won’t have to take the test for the Ad Rater, I know 2 other people that did not have too. You have two chances to take and pass the test. They don’t contact you and let you know if you failed even the first time. This sounded to good to be true and I guess it is! Could you let me know where you went to apply for this job? Like what site did you visit? I’m sorry that you have not heard back from them and I hope that you do soon hear from them. After reading this article and others about ZeroChaos I went to apply, and can’t find where to apply for this work either. I found the main profile and resume upload, but no application. Unfortunately, I don’t think the job is posted right now. You typically have to search for it on Indeed, CareerBuilder, or Craigslist. They will offer you a job if you passed. They will also send you the test letting you know how well you did. I heard back the next day. Anyone have an experience like mine? I applied in August, just started work last week (a lot of hoops to get through). I went through the training just fine, got my positive email from my 50 responses. I was waiting to start my actual tasks, but received an email today saying my project had ended. I have no idea why I would’ve been hired if they were so short on work. And all my feedback was positive. I’m so confused! Help! I just found your website and really like your content! Very informative, you really do a great job on help people make an extra money, thanks! I am in Australia. In August Zerochaos had advertisement in Craigs List for English Australia, and various other European languages. Its been 15 days and no reply. Does that mean my application is rejected? I have been hired by ZeroChaos for the Google Ads Rater position. It is contractual for a 12 month aggreement but this position is contingent on a background check, work flow and accuracy. They can cancel the contract at anytime without notice. You have to prove you are able to work in the US by going to a local testing facility and submitting your legal documents as proof. This was not long but it has to be done quickly as well as quickly complteing several online documents. One thing that is incorrect about this article is that ZeroChaos has strictly stated that you CANNOT sign back up after your contract is up, however they do review your workflow around your 11th month and may offer you another 12month contract. Note this is only for some individuals,NOT everyone and they ask that you do not cantact them about it. This article needs to be updated because I was too was a bit bummed that it was for a year but when I seen that I could reapply I thought it would be worth a short break but NO, you CANNOT reapply once your contract is up and that is IF they do not request for another 12 month extentension. I hope this helps everyone. Also check as many job board leads as you can to find postings for the postion.expand your search criteria for nationally. As I found my post on zipliner jobs for Louisiana and I live in Florida. I followed the specific instructions for sending in a resume and REQUIRED cover letter and assessment questions, and recieved a response within two days. Good Luck! Congratulations, If you don’t mind me asking, where did you go to apply? I have applied several times and have not heard anything back yet. It must be a long process. For you guys that used to work or are currently working for ZeroChaos, do you mean you can log in whenever you want (ex. weekends, late nights, no need to log in every day etc.) as long as you work at least 10-29 hours a week? Also, can the working hours be different each week based on your convenience? Thank you so much. Yes you can log in whenever you want. I actually like working late nights and saturdays and you do not need to log in everyday as long as you work at least 10hrs. and yes your working hours can be different each week. they do ask you at the begining an estimate of how many hours you plan to work every week but I don’t think it really matters if you work more or less as it is “at will”. May I ask you one more question? I was wondering if they require how many ads the ad rater should rate in an hour. I couldn’t find this information. Thank you very much! I don’t know, I am still new but there are many different kind of tasks and some require you to spend more time than others. I would GUESS that for the regular ones it should be at least 30/hr once you get used to rating them. I barely work on them now and I mostly rate in french which is faster for me as it is my first language. Have you already started rating? Thanks so much for your information. I just started. Yes, you can work any time and have different hours each week. You can log in multiple times a day, 24 hours a day, 7 days a week. Just as long as you meet minimum/maximum hours each week (10-29), there is no schedule to adhere to. I applied to an open position listed on Monster. My application status is still showing “received” and not viewed. Do I try to apply through a different site like Careerbuilder? I am worried that they won’t consider me if I apply twice to the same job through different sites, but I don’t even know if they will view my application on Monster. I do not know what to do or how long to wait. I applied about a year ago through email and never heard back, but shortly after got hired by Lionbridge. Needless to say, I forgot about ZeroChaos until I saw job postings. I gave up Lionbridge a few months ago, but really trying to get in with Zerochaos this time around. Any help would be awesome! Hoping to find someone who knows if applying twice through different methods will hinder me; if so, how long do I wait to apply through a different site? Thank you! I do not understand the onboarding process at Zerochaos. After gather all my info and an offer letter signed and my start day is confirmed they dropped the offer with very unclear explanation. It is my second assignment, no change in my background, references is good what is the problem? is it scam? PS: I forgot to mention that while you are an employee it is strictly on an AT WILL basis. I know that a few people mentioned that they were fired on a moments notice without notification or cause but unfortunately that is the nature of being an AT WILL employee. Your employment can last up to a year but like most jobs it is not guaranteed. I would still encourage people to apply and see if it works for them! From what I read when I was hired as I am newly hired, it did state that your employment will be terminated if your quality of work declines, just a note. Click on the link and press “Apply Now.” Note: you will need to setup a Free account on Careerbuilder if you don’t have one. I applied and for the first time heard back very quickly! I completed ALL of my employee (yup that’s right you are considered an employee and you are eligible for benefits) documents and within 2 days. The on-boarding coordinator usually handles all of your documentation and steers you through the somewhat long on-boarding process (it can take weeks but it also depends on how fast and accurate you complete the documentation and follow their instructions/steps). Tips: When applying be sure to write a short paragraph introducing yourself and highlighting your skills/qualifications. Also make sure that you answer ALL 6 APPLICATION QUESTIONS on YOUR COVER LETTER too. You’ll find the questions towards the end of the ads. DON’T FORGET TO ATTACH YOUR RECENT RESUME. Keep a lookout via email, once your application gets approved and you progress to the on-boarding process you’ll have to create a gmail account (if you already have one you’ll have to create a new one) and it CAN ONLY BE USED FOR ZEROCHAOS. Instructions will be emailed to you on the email you provide when you apply so KEEP A LOOKOUT and Don’t give up! Good luck! I hope this all helps! I just started this month and I am kinda nerves after all those comments. Are you guess ad quality rater for an specific language other than english? I will start working as an Ads Quality Rater on Monday 3/16/15. It was a long process to get hired. I am excited about starting on Monday and I hope it will be a great experience. I an thankful to Anna for all of the great information she provides on work from home jobs! Kenya – how long after completing enrollment documents did you get your start date? I just finished everything, including the I9, and was curious how long I will have to wait. Hi Kenya do you still work for Zerochaos ? Hi Kenya , I saw your comment and was wondering if you still work for Zerochaos? I’m trying to figure out why my assignment ended after not even 2 weeks. I received positive feedback during my training. And then out of the blue haven’t got any task assigned into 3 days later a received my email that my assignment ends today. I’ve been working for ZeroChaos for almost a year and I love it! Very flexible! My contract is ending soon and I’m hoping to reapply for the same position after the 3 month wait period. Great company! The work is great, but I’ve been out of tasks for one day and lost my access to instruction materials, feeling a bit nervous. Is this something that happens before they terminate you? Dear Anna don’t worry. Look at ZeroChaos Introduction email the have include phone number for technical support. sometimes they do not aware that there task shortage. Same experience on the 13th….sent out a TON of emails that never got a response and then last night 3/16 at 7 pm they sent me a generic email that the assignment is ending..this is after only 3 weeks of working for them, and receiving positive reviews. A whole lot of that seems to be going on. I went to GlassDoor and saw soooo many ads raters complaining about the same thing. They are extremely unresponsive, and although the pay is great, the amount of insecurity, lack of support or correspondence is not worth it. It is frustrating and unbelievable how they conduct a business. And then to not give a rhyme or reason makes no sense. Frustrated and irate to say the very least. Good luck getting through the application process. For a part-time, home-based that has periods where there is no paid work to do and that has paid assignments that can end at any time ZeroChaos expects Google Ads Quality Raters to submit quite a bit of personal information before the rater even has a clue if the job is going to work out for them. Unlike Leapforce or Appen Butler Hill, ZeroChaos does not ask raters to take a test to make sure they will be able to handle the job or if they have the skills to do the job. They jump right in with the application process. I recently received an email letting me know that I was being considered for the position of Google Ads Quality Rater position. Home-based, job lasts for 12 months, employee status, pay is $15.00 an hour with weekly paychecks being direct deposited into your account once a week. For someone seeking a home-based job this sounds great. Beyond great, actually. A week later I received a second email asking me to confirm that I was still interested in the job. I answered in the affirmative, filled out the form and sent it back. I was then sent an electronic application form to fill out. Since this is an “employee” position they first asked for standard employee information; name, address, phone number, email, social security number, job history and professional and personal references. After spending a few hours entering the information that was already included in my resume I was then directed to an electronic form section where I electronically filled out tax forms, answered different questionnaires and signed different company/employee legal agreements. This also took quite a bit of time. At one point I noticed that a couple of the documents I had filled out and signed had not been electronically received by their system I sent an email asking for help. Never got a response, but the forms did finally go through. Then came the I-9 Identity and Eligibility to Work Verification form. I am an American citizen born and raised (I truly hope that doesn’t sound snotty or snooty) and I already had the official documents to prove that I am legally authorized to work in the United States. Despite this ZeroChaos asked that I go to a “facility” in order to be “verified”. The closest “facility” was almost 100 miles away from my home. I explained this to the “Onboarding Specialist” and also told them that there were probably notary republics that were nearer to me and that I could have them verify that I am who I say I am and that I am able to work in the U.S. legally. I was then sent a form that I could take to the notary. After explaining how difficult it would be to get “verified” why was I the one who had to suggest a notary? After calling several different places I finally found a notary who was willing to verify me. I gathered my social security card, a copy of my birth certificate and my driver’s license, filled out the form I was sent by ZeroChaos and headed into town to get everything notarized. I came home and first checked my email to see if ZeroChaos had any more instructions or if they had communicated with me about anything else. There was an email in my account asking me to provide them with one professional reference and one personal reference because the references I provided for them “could not be reached”. The email also stated that my application would be terminated if I didn’t have my references responds to their request. Just after I finished reading that email one of the people I put down as a reference called me and asked about this “fishy” looking email she received that had 10 questions listed on it that she was supposed to answer about me. I explained what I was trying to do and my reference said that she would respond to their questions as soon as she had the time. I responded to the ZeroChaos reference email saying that I would do my best to get in touch with a couple of professional references and ask that they contact ZeroChaos as soon as possible. I then scanned, attached and emailed the notarized eligibility and verification form to the specialist. I immediately got an email back asking me to scan, attach and email them a copy of my social security card, my birth certificate and my driver’s license and email it to them. By this point I have had enough. Am I applying for a part-time home-based job that may or may not pay every week or that may or may not last a year or am I applying to be work as a Secret Service Agent? Applying for outside-the-home brick-and-mortar jobs is not this difficult. I immediately responded to that request saying that I was withdrawing my application for the Google Ads Quality Rater position, explained why and asked them to please delete my application information. Ironically, trying get on with ZeroChaos involves a great deal of chaos. Thank you Anna to bring it on. I had same feelings when after apply to ZeroChaos in November 2013, I was running back and force to provide and confirm and confirm what I had provided in in April 2014!….Other red flag for me was: they are not reply on your questions during work process unless you put “urgent” or “Second, Fifth or so Notice” in subject line and it is huge waste of timeto resolve anything. Other suspicions fact, ZeroChaos do not want hire you after second term. Even get approved to second term is almost impossible. From our side it looks logical that then longer your work then more experienced you are. So your professional performance would benefit the company more effectively. But it seems not the case for ZeroChaos. Thanks Anna for giving me an “online shoulder” to cry on – lol! You are welcome Marlene, I hope this information is helpful. I’m not trying to discourage people from trying ZeroChaos but I just wanted to give everyone a head’s up as far as what they will be in for when they apply and are accepted. ZeroChaos is a legitimate home-based opportunity, if you can deal with the way they do things. There are people who love working for them and, according to other reviews; there are people who feel otherwise. If it works out for other people then I congratulate them and I hope they get what they need out of it. It might be an especially good opportunity for those who have worked for Appen Butler Hill, Leapforce, etc. ; because they at least have first-hand knowledge of what these kind of companies and these types of jobs can be like. I just found the whole thing frustrating and invasive. I felt like I doing a lot of leg work and handing over every nugget of personal information without really knowing what I was getting into. I went through this a few months ago and don’t consider it a lot of hoops. Everything’s relative. How many part-time positions from home are going to deposit anywhere from $150 to over $400 per week in your bank account, based on your preferred schedule? Any reputable employer requires background checks and references. Maybe if you’d given your references a heads up they would’ve responded in a more timely manner. Once I received the approval/invite email, I was working within two weeks. As long as you can read and follow directions, there’s no drama here. Love it and find it was well worth the couple of hours of annoying paperwork. Hi, Is $400 per week or $15 per hour after tax or do we have to pay taxes? Is it safe to give your SSN no. over email? I’ve applied about 5 times since October. I haven’t gotten a response either. It seems like a good job too. How did you go about applying? Did you apply on their website or some other way? Hi! I’ve applied three times to this position (little desperate eh?) I havent received any type of response. Just playing the waiting game. When they say college degree what do they mean exactly? Do they mean like you graduated from a 4 year university? If you completed a one year course at a business collge does that count? I re-apply 3 weeks after working for them for 1 year. I don’t know if it is a good idea to send them an email asking if I am eligible for a second assignment…. Hello. Does anyone have experience re-applying for ZeroChaos as AQR? How was the second experience? Did they ask for all the info (notarized documents, etc) as well? How long did they take to get back to you after re-applying? I worked my entire first year and I ‘d like to be re-hired after the 90 day mandatory break is over. Obviously it was a great experience. After desperately looking around to other similar companies/projects, I realized the Ads Quality Rater with ZeroChaos was (by far) the best experience. Payment always on-time, the job itself was not very difficult, and they were very professional -both ZeroChaos and the Google staff-. I tried other companies/projects, and it was terrible. Guidelines that didn’t make sense, unrealistic goals, etc. You name it. I want to be back at ZeroChaos! I’m very curious about this also. Do they usually accept you back after the 3 month break? My year is up soon and I’m hoping to come back after the 90 days. I’m afraid that if I’m back to applying like everyone else who hasn’t worked for them yet, that my odds of getting back in with them is slim. Anyone know? I also worked for ZeroChaos for my one year term, waited my three months and reapplied. I got a response stating that the process is more vigorous for the second term and that it could take up to a year to be reinstated at the job. As far as the first time I applied, it took them so long after the initial ‘thank you’ email, that I forgot I had even applied to them. My initial contact was a phone call, that lasted approximately 20 minutes. Everyone is very professional yet personable too. I loved this job also. Right now I’m working for Lionbridge going on my 2nd month. I am still anticipating my call back for ZeroChaos. They also do provide retirement after a certain amount of time with them, not sure how long though. You can opt in or out of this retirement plan. I opted out because the information states that you can work for Google for 2 cycles then you won’t be eligible to work for them again. But I also talked to someone at ZeroChaos and they contract for different companies to provide workers, but she couldn’t tell me who. All I was told was to check the job boards like Career Builder. I have my LPN degree which is an 18 month degree, not even an associate’s but they still hired me. Sounds interesting. Looking at the earlier posts, looks like they want the resume attached as a text possibly in an email. Do you know if that is still the case and if so, who would I send the resume to? I would like to ask if any one know how easy to re-apply to ZeroChaos ADS Editor position if I have quit month ago? Did you make sure the period was not at the end? I sent the email from the job posting and it bounced back as undeliverable. I sent it to temporaryjobs@google.com. Did I read something wrong? Thanks in advance for any help! I was thrilled when I was initially hired by the company that was then known as Workforce Logic in 2011. I served out my entire first year, went well, reviews were always positive, things were great. In July of this year, I was informed that I was up for a second term if I wanted. Awesome! In my first month, all of my reviews were positive; of course, there were things that could “use improvement,” but the tone was a positive one. Around a week ago, they sent out an e-mail about task shortages. By this time, I had been working for them for 5 or 6 weeks. So, who knows. Maybe it was the task shortage. Maybe it was me. But it sure does stink. I started last August and then got a notice in February that I had to submit my work within 24 hours with assignment being over. Short notice really stunk. There were periods of task shortage with my project too. The initial paperwork after being accepted for the job was a bear – many forms. My understanding is I only have a week to schedule my test with LB, so that doesn’t give me much time to wait on ZC to reply, which apparently can take a while…. I’d hate to start with LB and get an email for ZC the next day for a position that pays more per hr AND more frequently. However, waiting on an email that might take a month or two instead of working and making money doesn’t sound too smart either. What kind of hours are people logging with ZC on a weekly basis? How do you send the resume for this position, I see they want it in text or HTML link? They are wanting people to just email it to them. You can copy and paste the contents of your resume into the body of your email and then send it, if I’m understanding their instructions correctly. Looks like they may not want it attached as a file. I applied in mid-July and got a prompt response with further instructions. I completed all of the requested information. I began on August 11; I am on my third day as an employee and I have to admit, so far, I AM LOVING IT! The work is fairly easy, as the instructions of what should be done is given to you for each task. I like that I can log in when it is convenient for me and I do enjoy rating the tasks. Best of luck to all of those who apply/applied. Hey Ms. Genese, You may be one of the ones I be in deliberation with, since we started a week after each other..lol I am so glad that some of you have had quick turn a rounds like I did. I absolutely love it also. Very easy work, very easy money. I just signed up today. I will reply back when I am contacted from them. Within seconds I got back an automated email response titled “Thanks for applying to Google.” With a link to complete a Voluntary Self Identification form. I’ll let everyone know when I am contacted by a recruiter. Well I applied on July 2nd. I just received a response today stating that my application had been received and that I meet the qualifications (I don’t have a Bachelor’s Degree but still qualify) for the “Ad Quality Rater Position”. It also stated that I will be added on a wait list for the next available opening which would be in the next two months but no later than the end of September. Well I will be patiently waiting because I have heard some great reviews about this company and I can’t wait to start working for them. UPDATE: I started working for them on Aug 4, 2014 after applying on July 2, 2014. I was really blessed that it moved so quickly for me. I have heard that it can take anywhere from 1-3months to hear from or actually start working for this company. When I applied I didn’t hear from them right away. It actually took roughly two months before I received notification that my resume was received, accepted, and I was placed on a waiting list. Two more months later, they contacted me again and the hiring process continued. Just an FYI for those who have applied and haven’t yet heard back. I have a B.S. and a Masters and applied a couple of weeks ago and haven’t heard anything back either. At this point I’m not sure there is a true selection process-maybe just the luck of the draw? Otherwise it makes no sense why those who are qualified never hear anything back. I’d like to know what email address we should use to apply? Hi, I will like to find out if you know of any company that will hire pople to work from the country Serbia it is one of my friends he speaks flunent english and write english. I have a Bachelor’s Degree and applied last week. I got a thank you for applying return email but have heard nothing further. I so hope that I hear back from them. This sounds like an unbelievably good opportunity. If I do not hear from them does anyone have any suggestions as to how soon I should reapply ? I don’t want to bombard them but I also want to be considered. I applied on May 7th, received a Thanks for Applying email, but nothing after that. did you get a response back from them yet. if so did you get the job, just applied myself last week, still no response yet. I received the “thanks for applying” email the same day that I applied, but nothing more. I’m kind of assuming it’s a no-go, but am still slightly hopeful, I guess. Do they want the resume as an attachment or copied/pasted in the email? Anyone know? They want it as either a .txt or .html attachment. I currently work for them an I ABSOLUTELY LOVE IT. I have worked for other rating companies and this feels wayyyyyyy better. I am more relaxed and focused. The instructions are simple to follow. The weekly pay and the fact that you are an employee is the icing to the cake. The only con is that it is a very difficult position to get. I applied over an over again for more than a year before I was considered. Another downside is it ends after a year but you have the option to re-apply after 90 days. Did you just keep on sending your resume to them? I have applied 3-4x and absolutely cannot get a response from them. I meet all the requirements and follow the application instructions exactly and still nothing. Danielle, I’m so sorry to hear that! As soon as I heard of them, I applied for them only 1x & everything fell into place step-by-step regarding working for them. It boggles me what makes certain people get certain jobs so easily & others don’t. I’ve had my share of turn-downs. Now I don’t know if this has anything to do with it, but the person I heard about this job from (who’s worked the job too) happens to have a Masters degree. I happen to have one too. Now, we BOTH have friends without degrees who applied & they never heard from this company. I know this company wants a Bachelors…why I don’t know. I don’t have a degree at the moment but my situation happened just like yours Blue. As soon as i found out about them, I applied and received a response a few days later. Does anyone know if they use the same process and software? I was with Appen Hill and hated it. The software was horrible and always crashed. I’m unsure because I never worked for the other companies but I can tell you the I never had a issue with their software. I was able to apply through the email provided on the google page that pulls up. I currently work for Lionbridge, would this be a conflict with them or no? There is a lot of debate on this … but I think most people say that you can’t, although I don’t fully understand how they know if you are. But I think they have a way. I do think that if you stopped working for Lionbridge you could work for them, but not work both at the same time. Someone correct me if I’m wrong. That is great! Do they email or call you after your submit your resume? They email you. I never talked with anyone by phone during the entire hiring process. I currently work for them too & love it as well. Direct deposit straight into your bank account promptly on Fri mornings. Nice pay stubs that you can print out for your records. My year isn’t over for a while, but I sure will try to work a 2nd year & who knows, maybe by then, there will be some way to stay on a 3rd year or more! I currently work for this company and absolutely love it!! Unfortunately my contact ends in July and I have to wait 90 days to reapply but definitely will! I never worked for the other rating companies but this one is the best hands down!! Also, my experience did not reflect the qualifications for this position and was still hired. So if you don’t think you meet the qualifications, apply anyway! Thank you for sharing your experience with this company. How did they contact you? They contacted me through email. Everything was done that way. I never talked to anyone on the phone. Thank you for your feedback! I always love to hear that people are having a good experience with different home-based jobs.